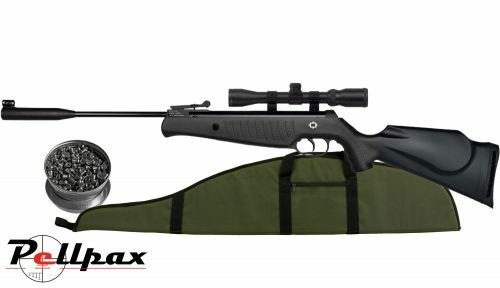 This Pellpax super stealth youth kit, comes with a 4x32 scope, pellets and a bag. The calibre of the rifle is .22, The stock can be used in all weathers with a anti shock and fibre stock. The automatic safety makes the rifle a lot safer to use. The grip and forearm of the gun is from a pistol. This rifle provides a smooth and controlled shot and a sound moderator that reduces the noise to a minimum.